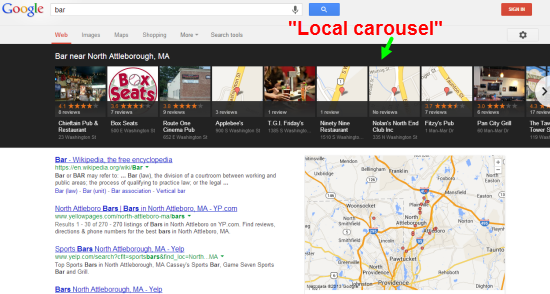 It’s no secret that I don’t like Google’s “local carousel.” It’s ugly, inconvenient, and counterintuitive. Much ink has been spilled on the carousel. Many excellent points have been made. We local-search geeks (not to mention business owners) have questions about the carousel: how will it evolve, to what extent will it roll out to the search results for all local businesses, and – above all – is there another shoe that has yet to fall. 1. The carousel is not fully formed. Google will iterate. It already has: It’s replaced the “Zagat” ratings in the carousel and elsewhere with the review stars. Also, the carousel seems to be a missed opportunity to push Google Plus on users (a la “new” Maps) – which is another reason I think Google will change the carousel around – so as to ram Plus down more users’ throats. 2. All the search terms that trigger the carousel are for “fun” or non-essential businesses. Carousels are fun (unless you puke afterwards). Fitting, no? 4. The photos (or tiny maps) are an absolute waste of space. Searchers would benefit much more from seeing the phone numbers, addresses, and URLs of the businesses up there. The photos might be somewhat helpful if they consistently were of storefronts or Street View shots. But that’s not the case. They photos are either of food that looks like it’s sitting under a school cafeteria heat-lamp, or they’re of unintelligibly tiny squares of a zoomed-in map. They do not help or inform the user. 5. Doesn’t the carousel seem a lot like Google’s Hotpot flop? Hotpot was also centered on reviews, and had the same side-to-side pane layout. Now it’s worm food in the Google graveyard. I hope that the carousel as a whole – or at least the current incarnation of it – will meet the same fate. 7. I’m guessing one main reason Google resumed showing the golden “review stars” was to take eyeball-share away from Yelp (and other IYPs). What happens when you click on a carousel search result and then see a “branded” search for a business? Right: Yelp’s search results are right near the top of the page. If Google weren’t showing the golden review stars we all know and love, then Yelp would be the brightest peacock. 8. The carousel is much taller than it needs to be. There’s a lot of blackspace above and below the panes for each business. I think that’s another attempt to squeeze Yelp. 9. Businesses will probably never be able to control which images show up on their carousel panes. If they did, there would be too many opportunities to upload eye-catching but irrelevant photos – not to mention photos that have the caption “I’m with stupid,” with little arrows pointing to the left and right. Then Google would have to add a “report a problem” mechanism to the carousel, sort out problems, and generally deal with other dirty work that Mountain View typically avoids touching for as long as possible. 10. Why doesn’t the carousel truly live up to its name and let the users scroll full-circle through the search results – in such a way that if they keep clicking on the right-hand arrow they eventually return to seeing the first batch of local search results? What are your observations on the carousel? I am really torn on the local carousel. Is it a more opaque system that takes control away from a business owners/marketers? Of course, this is Google we are talking about. Could it show more relevant information to consumers? See previous answer. However I do think it’s visually striking and our early feedback from business owners is that they love it. This makes me hope they iterate on it rather then scrap it and start over, like they always seem to do with local. Great points, Dan. I agree. The carousel has a lot of potential, but this current iteration is terrible, in my opinion. That’s one reason I’m confident it will evolve. Hey there, thanks for taking the time to write the article. It takes a lot to sum up all your feelings so please note that I’m not thrashing your article, just trying to think up where I see carousel going. 1. Carousel is meant for google glass. It’s going to roll out to other fact based industries. Start thinking about google as “cards” and rich snippets to the Nth degree. They have to box it all up into neat little tea-sandwich sized bites. 2. You can change your image if you create a G+ page and get it verified. They pull your profile image for these. 3. I agree with your point about adwords completely. If you look, the carousel “cards” are all organized by distance from your ip address location except for a few instances where they are really well rated and they rise up in the listings. expect the top 1 or 2 places to go the way of adwords about 6 months after glass launches. That’s my thought. Great post either way. It helps to get good perspective on everything. Good points, Drew. Thanks for weighing in. My understanding – based on the official word from Google – is that your carousel pic may or may not be your profile image, and that you can’t control it. Is there a bigwig at Google or someone else who said that the carousel is meant for Glass? I’m sure you know of something I don’t in this regard. But either way, I’d have a hard time accepting that, because it would be crazy. 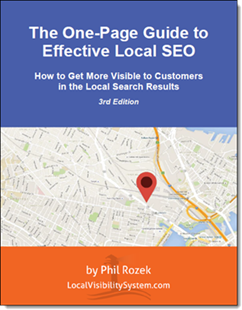 Google wouldn’t shake up the local results – roughly 30% of all search volume – just to accommodate the few golucky geeks with Glass. Nor would Google change the look of the SERPs preemptively, based on the assumption that Glass will maybe someday kinda sorta catch on big-time.